In recession-strapped times it can be difficult to find the balance between having fun and spending money but a chocolate pamper party is the ideal way to treat yourself and your closest friends without maxing out your credit card. A stylish but cost-effective chocolate spa party will thrill all your friends without breaking the bank and give you a chance to explore your chocoholic side at home. Use your imagination as well as your tastebuds to create a party that will pamper your body, delight your senses and feed your spirit as well as your tummy. Choose chocolate-brown ink for your invitation cards and send each one in a padded envelope with a chocolate treat. Make sure your guests know what to wear and bring. Comfortable clothing is important for spa fun and if people need to bring a bathrobe for body treatments or flip-flops for manicures, let them know well in advance. If you can find chocolate letters – often sold at Easter - why not play chocolate anagrams, by asking people to make as many words as possible from a selection of letters and the person who produces the most words on the back of their invitation cards wins those letters as a take-home prize. Some people like to have chocolate scented candles, while others find the smell overpowering. You might want to pick a complimentary fragrance, such as citrus or vanilla and use chocolate accents such as chocolate brown ribbon tied around candles or brown silk flowers in a vase. Cheaper unscented tea lights add pretty lighting effects at less cost. Pick another colour to go with your chocolate theme, such as mint green, cream, fondant-pink or lavender and use that as part of your décor. If you chose mint, then set out pretty green plates bearing chocolate truffles with crystallised mint topping. Offer mint juleps or mint tea to drink and have minty footbaths. If you choose a pink accent, follow the theme through with pink plates offering assorted strawberries dipped in dark, milk or white chocolate, pretty pink flowers in vases, cranberry or pomegranate based cocktails and pink footbaths with floating rose petals. There are healthy choices in food too. Try some raw chocolate treats which are high in antioxidants or make trays of crisp green apples half-dipped in dark chocolate, peeled and sliced bananas dipped in chocolate and then frozen or chocolate covered almonds and brazil nuts. It has to be Death By Chocolate! This chilled recipe is ideal for a spa party. Put all the ingredients in a blender with some ice and blend until smooth. 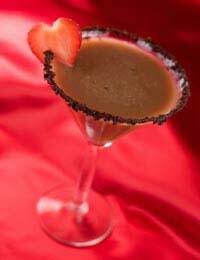 Pour into a large glass and sprinkle with chocolate shavings and chopped mint. Serve immediately. You’ll need to have plenty of towels, foot saunas or just chocolate brown washing up bowls for people to soak their feet and smaller glass bowls for soaking fingernails. For manicures you also need cotton wool and nail varnish remover, pumice stones and nail files as well as nail varnish. For facials you need chocolate brown hair bands to hold back hair from face packs, facial wipes and moisturiser. Offer a chocolate scented foot soak with chocolate or vanilla bath salts. Scrub with a scrub to which you have added a little cocoa butter and a spoonful of cocoa powder to give a chocolate scent and colour. Apply pretty chocolate coloured nail varnish: choose three colours that are close to dark chocolate, milk and white chocolate and let your guests pick their favourite.Use the same system for a hand soak. This facial mask is particularly good for combination skins. Push the berries through a sieve to remove the pips and then blend with the yoghurt and cocoa powder. Refrigerate until about two hours before the party, so it’s not too cold on sensitive skin. Apply to cleaned skin and leave on for seven minutes for sensitive skin or fifteen minutes for teenage or congested skin. You only need to use a small amount so this should easily cover six faces. Rinse off thoroughly.